Apple has joined the ranks of the tablet computing zealots, loud in their praise of the ultra-slim computer as a device set to sell and sell. But, as Tony Glover reports, in the absence of a killer app the channel is reserving judgment. The hysteria and hype surrounding the launch of Apple's iPad was such that the Wall Street Journal commented: "Last time there was this much excitement about a tablet it had some commandments written on it." And as with the message Moses brought down from the mount, belief in the future adoption of the iPad and the other tablet PCs unveiled by Microsoft chief executive Steve Ballmer in Las Vegas earlier this year remains largely a question of blind faith. According to bullish industry forecasts, the take-off of the new device will be more dramatic than that of the iPod and will put netbook sales firmly in the shade. Citigroup, for example, predicts: "The market volume could ultimately top that for PCs and rival that for mobile phones. We see the worldwide market for tablet devices at 200 million units in 2015." To put this figure in context, Intel estimates annual netbook sales at 45 million, while the ubiquitous iPod has shipped only a little over 250 million units in its entire history. Even chipmaker Intel is having trouble digesting figures like those from Citigroup. "It is really difficult to tell what the adoption rate for these devices will be," says Intel spokesman Johann Weber. "The form factor has been around for years. "The forecasts are only as valid as the underlying assumptions. Citigroup predicts worldwide sales of 70 million within three years while IDC forecasts only 1.8 million. To achieve the higher predictions, the tablet form factor would have to change the current usage pattern." As always, then, the industry is searching for a Holy Grail, a killer app that will make an otherwise standard device a must-have for hundreds of millions of consumers. Despite all the hype from Apple and other tablet manufacturers, it is by no means certain what the tablet's killer app might be. "It has to be a breakthrough, enabling users to do something that you cannot already do with other devices out there," says Weber. Even Apple CEO Steve Jobs was unable to sound convincing that he was showing the world anything really new when he unveiled the Apple iPad. Jobs began by posing a question that remains unanswered as far as the industry is concerned. "Everyone uses a laptop and/or a smartphone, and the question that has arisen lately is, is there room for a third category of device in the middle, somewhere between a laptop and a smartphone?" Jobs showed how the iPad could be used to watch videos, read e-books, organise photographs, send and receive e-mails and play electronic games. The problem is that all these applications can be found on existing products. "Despite the introduction of Apple's iPad and the rash of reactionary prototype tablet announcements from PC makers at [trade show] CES, IDC continues to forecast only modest growth in the tablet PC market," states the analysis company. "The simple fact is that the tablet PC form factor has been around for a long time, and while it has grown into a profitable niche product in some commercial vertical segments, it has never been a success with consumers. "As recently as 2006, Microsoft and high-profile partners such as HP, Gateway and Toshiba launched new products and a high-profile marketing campaign to convince consumers that they wanted a tablet PC. Consumers begged to differ back then, and after all the hype surrounding this 'new' form factor dies down, IDC expects today's PC buyers to respond the same way." Computer retailers also appear reluctant to join in the chorus of praise raised by the tablet evangelists. Those prepared to answer the question of how they expect the new tablets to sell do so in a guarded manner. PC World category director Jeremy Fennell says: "There is a lot of excitement about the new tablet technologies which are coming onto the market as touchscreen technology continues to evolve and grow in popularity. They are an interesting new entrant and we look forward to adding them to our ranges when they are available in the UK." Neither PC World nor Currys wish to make any kind of numbers forecast about demand for tablet computers. The situation is not likely to change even with the introduction of the HP Slate. "The HP labs have been working on the slate concept for five years," says an HP spokesperson. "The HP Slate is going to be the first in a new category of products that are aimed at content enjoyment, constant connectivity, enjoying books in full colour and much more." But even HP is forced to admit that it has been flogging this particular horse for almost a decade: "HP has had long leadership in the tablet category, having introduced its first tablet in 2001." And if anyone listening to Jobs enthuse over the iPad had a distinct sense of déjà vu, that's because Microsoft chairman Bill Gates was eulogising the tablet format a decade ago. "The tablet takes cutting-edge PC technology and makes it available whenever you want it," said Gates at the time. "It's a PC virtually without limits, and within five years I predict it will be the most popular form of PC made in America." The tablet's supporters still believe that Gates got it right in principle and that Jobs has, with typical Apple business acumen, moved into the space just when the tablet's time has come. They argue that increased battery life of up to 10 hours, sophisticated touchscreen technology and fast mobile internet speeds make the tablet far more appealing than in the past. But that still leaves the thorny question of what the new device's killer app will be. The reason the channel is reluctant to endorse the new devices more enthusiastically is that there is as yet no clear overriding reason for anyone to want one. Apple made much of gaming at the iPad launch. But serious computer gamers have been historically reluctant to sacrifice PC power for portability or a cute design. And, Weber says: "We have light games that people tend to play on phones and notebooks. This is not, however, a volume business model." Its size also makes a tablet device a curious choice for anyone wanting to access e-mail or listen to music on the go. Aside from the fact that most people already carry mobile phones, an increasing number of which support e-mail, tablet computers are far too large for a jacket pocket or a handbag. So carrying a tablet around requires a separate computer case or daypack, making it no more convenient as a portable device for e-mail than a netbook or notebook PC. Of all the applications so far identified for tablets, mobile entertainment and information are the strongest reasons for anyone to buy one. Some people prefer to watch videos when commuting or travelling. Others like to read books or skim through a newspaper or magazine. Apple and HP would argue they can do all of that more easily on a tablet device than on a laptop or a smartphone. The best hope for a killer app for tablet computing is the publishing industry's gradual but irreversible shift from paper to digital printing. Leading book publishers such as Random House are already experimenting with the new medium to produce hybrid e-books. "New products such as the iPad are enabling publishers to develop new applications specifically designed for the new media," says Random House group digital director Fionnuala Duggan. "These can include animation shorts and video and audio clips." According to Duggan, the new digital medium lends itself brilliantly to the insertion of added value content at key points in a fictional narrative. Random House has already been trialling some of the new storytelling techniques on the iPhone. Duggan says: "Random House has, for example, already developed a short animation for the iPhone based on the opening pages of the Lee Child thriller Gone Tomorrow, taking the reader through a 12-point list of ways to spot a suicide bomber. "Some authors lend themselves to this type of treatment, particularly crime novels, thrillers and science fiction. We have also produced video clips in order to whet readers' appetites for the next books by a popular thriller writer in the same way the film industry uses film clips to market coming attractions." But the jury is still out on whether readers will be tempted more by the new medium offered by tablets or will prefer the current generation of dedicated black and white e-readers from manufacturers such as Sony, which offer better visibility in direct sunlight and come in sizes more suited to a jacket pocket or handbag. "The industry needs a better understanding of what the consumer wants," says Stephanie Duncan, digital director at publisher Bloomsbury. "Is it, for instance, backlit pages with full colour and video, or easier-to-read e-ink and a longer battery life? An immersive reading experience or added extras?" The publishing industry is currently at the same crossroads the music industry reached a decade ago when consumers began downloading digital copies of records. It is facing a similar set of tough challenges in not wanting to discount the value of authors' content but not losing out on the digital marketplace in the process. It is not being helped by a widely held consumer conception that digital copies of books should be cheaper as they do not have to support paper or physical distribution costs. "There is a misconception that digital books are cheaper than print copies," says Duncan. "Unfortunately, this is not the case for a number of reasons. In the UK, for example, digital books are subject to VAT whereas print books are not. There are also fixed costs associated with the publication of a new book such as the author's advance, editorial, production, conversion, digital storage and distribution, sales, marketing and publicity. In short, publishing a book has costs regardless of the delivery format." Newspaper publishers and content providers such as the BBC are also beginning to address the mobile digital market. 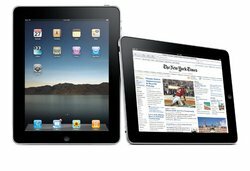 Devices such as the iPad are ideally suited to viewing digitally printed news pages that offer video clips in place of still photographs. Intel believes that the new tablets could prove popular home devices for some consumers, offering them a kind of hub to manage all their entertainment media. "The tablet could be a mobile device or be used as a media player in homes in conjunction with other devices," says Weber. Intel adds that the new devices have considerable possibilities in the commercial market. Hospital staff, for example, could benefit greatly from having a tablet to display x-rays, medical records, drug dosages and all the other crucial information needed when making the rounds of hospital wards. But, according to Weber, the development of this type of vertical market is dependent up the development of an underlying support system. "The challenge is not the availability of a handheld device but the creation of the necessary infrastructure and we are all working at providing these kind of solutions," he says. But while there are many vertical applications where a tablet device might appear an appropriate solution, Weber says the established market for such vertical devices worldwide is only around 20 million. Despite the hype, the future of tablet computers remains as uncertain as it was when Gates made his first bullish predictions for the new form factor almost a decade ago.